You will soon be going to get another bouncer from Reliance Jio with their upcoming broadband service. This internet service would supplement Reliance Jio 4G wireless across India. This upcoming broadband service will be launched by the name- JioFiber Preview Offer and soon will be available in few selected cities. The broadband service will be offering 100 Mbps internet connection for a trial period of three months. Yes, It seems like a dream but it is actually true! Seems like Reliance is in the mood of back to backfire shots! 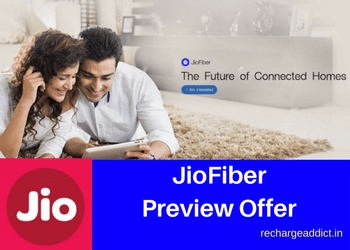 As the result of this tempting offer, JioFiber Preview Offer has stimulated the ever stagnant and neglected internet market in India. Hence giving cut throat competition to the market leaders. Here are some useful information and details of JioFiber Preview Offer. The upcoming broadband service from the house of Reliance is going to follow the same market strategy of Reliance 4G internet. Since JioFiber will be launched under the impetus of Jio 4G, it has already created an excitement among the users. It will follow the same concept of 4G of offering the most economical and fast internet service. Therefore, Reliance will focus on attracting maximum customers with the most feasible and economical plans. Consequently, capturing the maximum market share in their favor. The date of the launch for JioFiber is not confirmed. But, it is all set to roll out the service in the coming month. This implies that the company is already offering this service to a few selected customers and its employees for doing a test run for JioFiber Preview Offer. The test run for the upcoming JioFiber net connection is going on in five major cities. The metro cities- Mumbai, Chennai, and Delhi are among these selected cities. Apart from the metro cities, Pune and company’s hometown- Jamnagar (Gujarat) are the testing points for the Preview Offer. A lot of things depend on the reviews of these trails. Based on the feedback of the testing, the company would finalize the service plans and date of its launch. Reliance seems confident about their plan for JioFiber. The company recently at a fiber connection conference at Delhi, shared the details of their upcoming broadband with some delegates. Since Reliance is following the 4G strategy, all eyes are on the details unveiled by JioFiber. Same as Jio 4G, you will get the services of JioFiber absolutely free for the initial 3 months trial period. With the connection, you will be getting 100 GB data at an unbelievable speed of 100mbps. It is noteworthy that after 100 GB data consumption, the internet speed will reduce to 1mbps but the internet will continue. In conclusion, the plan brings you an unlimited internet at an economical value. The JioFiber Preview Offer doesn’t only gives 100 GB data but also gives a complimentary access to other Jio services. These services include a cloud storage of 5G, dual-band WiFi routers for indoor coverage and much more. Therefore, all these in combination will provide greater connectivity and uninterrupted service. In addition, the JioFiber Preview Offer also have a great feature to have a check on unauthorized connects to your device. With the help of a cloud link, you get a notification if some unknown device connects to your Fiber Home Gateway. How to get the connection? You just have to follow the same procedure to get your Jio 4G sim. Means you simply have to make a call on a given toll-free number or have to send an email to the company. The JioFiber Preview offer has simulated the neglected market of high-speed broadband services in India. As a result, Airtel, the ruling broadband brand in India is also planning a similar internet connection. The plan is called V-Fiber with DSL2 + technology. It internet service through telephone wires and offering 100 Mbps plans in some selected cities. Airtel is also offering fiber internet service of 100 Mbps in some selected location in India at a very nominal price. The new player ACT fibernet is also in the race. Act fiber started their operations in the southern region of India in 2015. Now they are expanding its services in other regions as well. Recently, it has launched India’s 1st 1 Gbps connection in Hyderabad. Their plan is to expand its service in another 11 cities. Brace yourself for the JioFiber Preview Offer storm in the market!